It is time for another Makeup War!!! This week the Makeup Wars bloggers are sharing their favorite items for travel! While I do have some favorite products that I always travel with which I will share with you...I do have a packing secret: I load up my travel toiletries bag with goodies from my various Beauty Sample Subscription boxes!!! As my loyal readers know, I have a bit of a healthy obcession with Beauty Sample subscriptions. So, I have no shortage of travel sized products in my home. Even those good ol foil packet samples of shampoos get used when my family goes on trips! 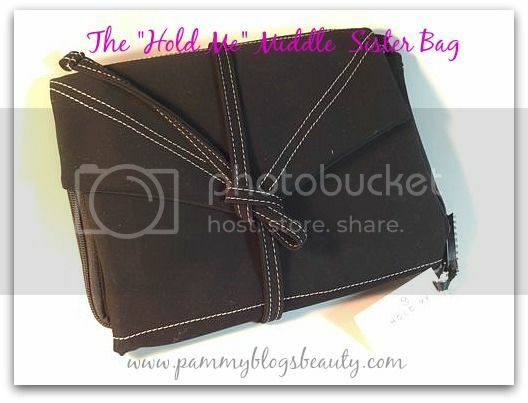 Before we dive into my product recommendations for travel, lets talk about my newest travel makeup bag: The Hold Me "Middle Sister" bag! From previous travel packing posts, ya'll know that I love the classic Hold Me bag (perfect for a long trip) and the Hold Me Mini (ideal for a weekend getaway or even your everyday purse makeup bag). Well, the Hold Me company now has a size in the "middle": the Middle Sister! It really is just the "right size" for a short trip (longer than a weekend). The Hold Me bags are great because you can tuck away your makeup flat in the zippered compartment and there is an area to keep your brushes organized, too! So, you don't have to pack an additional brush roll. The quality of these bags is just stellar. Plus, they really protect your makeup and keeps everything super organized and in its place. 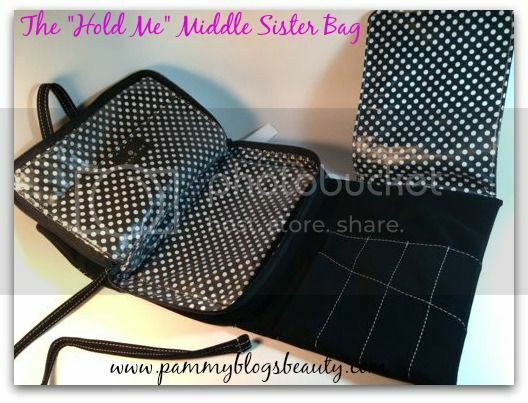 I adore these bags and think that this "Middle Sister" bag is a perfect addition to the Hold Me line. When you open the bag, you can see everything at a glance since it is stored flat. No digging around for what you need! Plus, the flat design is great for packing into your travel carry bag. This bag is very sturdy and high quality. The outer fabric is a lush faux vegan suede and the inside is laminated fabric. Both fabrics wipe clean very easily. There is no question that I will have many years of use with this high quality bag. I find that all the Hold Me bags are particularly nice if you like packing makeup palettes. The flat design is very well suited to hold a palette flat and protected. I usually travel with one main palette. The Middle Sister size bag holds a mid-larger sized palette well with room to spare. I love the extra piece of flat material (one side faux vegan suede and the other is laminated). I use this as a layer when I am packing the zipper compartment to protect items. When I do my makeup, I take this layer out and use it as a clean workspace on the counter. Covered brush section has 8 sleeves. I can fit both full sized brushes as well as travel sized brushes in here. I put my kabuki in the middle zipper compartment. Retails for $75.00. I know, this is very expensive. However, you are getting a serious high-quality makeup bag here. You really won't be disappointed and will have a bag that holds up well while continuing to look good for years to come. My other Hold Me bags still look like new and I have had them for a couple years now and use them all the time. Beauty Sample Subscriptions/Beauty Boxes: With all of my beloved beauty sample subscriptions, about 75% of what I pack when I travel comes from these little boxes! It really makes packing fun. I just toss in an assortment of high end luxury beauty samples for all of my toilitries...from shower gel and body butter, to hair serum, shampoo, and skincare, these beauty sample services keep me well stocked up in travel sized items! Then, when I am on vacation, I have so much fun playing and exploring new items. Often, I end up getting purchasing the full sized item of a sample that I tested out while out of town. It is really so fun! Birchbox: I have literally subscribed to Birchbox for years and I am a totally happy customer. Their boxes are $10.00 per month and contain 4-5 deluxe beauty samples from high-end brands. Overall, I have been totally pleased with this subscription service. You can earn points for referring friends and you can also earn points for reviewing the products you get in your box. Then you can "spend" your points in their online Birchbox shop. I have been introduced to so many great new brands from Birchbox! I love Birchbox!!! 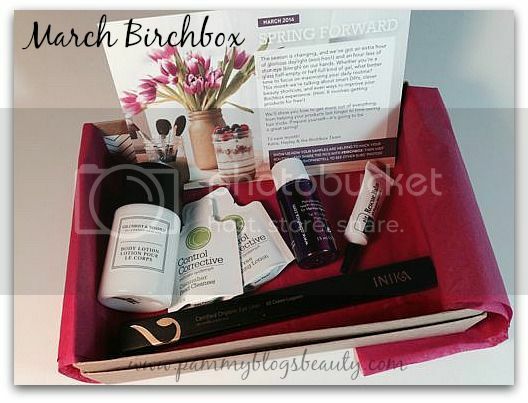 :) Are you not a Birchbox subscriber yet? Here is my referral link to sign up: Sign up for Birchbox! I love the variety that I get in my Birchboxes: Skincare, Hair stuff, lifestyle extras, makeup, body stuff, etc. Plus, the brands are all luxury. 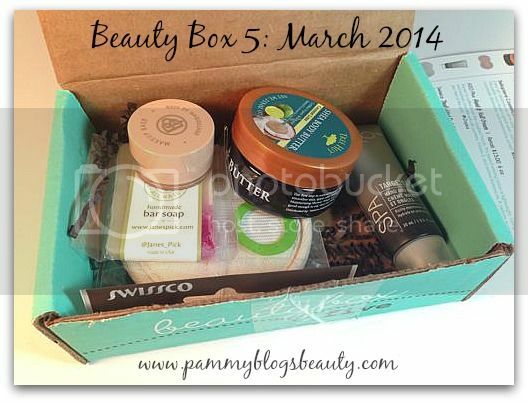 Beauty Box Five: I am pretty new to Beauty Box Five. I got my 2nd box this month and I am one of their blogger ambassadors. For subscriptions, you have the option of monthly ($12), quarterly ($30), or annually ($100). The boxes are a mix of makeup, hair, fragrance, skincare, and body products with a mix of high-end and drugstore items. I am still getting to know this subscription service, but overall have been quite pleased with the boxes and the items inside. ipsy: ipsy is my "newest" beauty sample subscription. I was a subscriber back when it was called Glam Bag. They have totally improved their bag and service since their GlamBag days! After consisitantly seeing how great these bags were, I had to re-subscribe to the improved ipsy service! I just got my first bag this month and it is *fantastic*! All makeup samples from brands I love! For $10.00/month, this is a great deal if you are a makeup-lover! Plus, the bag is super cute. I always find a ton of uses for those. :) This service was founded by YouTube sensation Michelle Phan. There is also an online ipsy community that goes with your subscription. 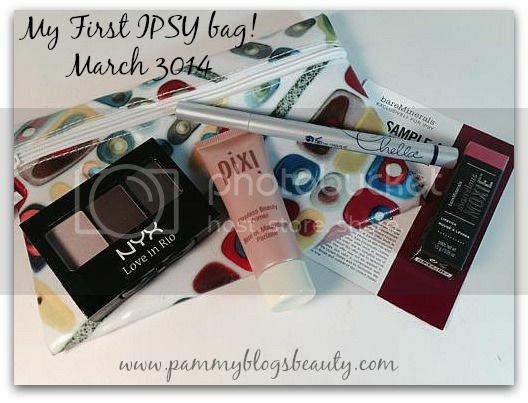 Are you not an ipsy subscriber yet? Here is my link to sign up: sign up for ipsy! If you love trying new makeup, this is the subscription for you!!! Julep: I have been a Julep subscriber (a Julep "Maven" as they like to call subscribers) for a really long time, almost as long as my Birchbox subscription. What keeps me with Julep...I love nail polish! This is a monthly nail polish beauty subscription for $20.00 per box!! Each month you get to pick your box from a choice of like 5? boxes? Each box is in a specific category...for example, I usually get the "Bombshell" box. Every month you get an email with the items in the box that matches your Style Profile. If you don't like the selections in your box for the month, you can simply opt for another box (which you can totally choose yourself), or you can "skip" the month. The boxes generally have 2 nail polishes (full size) and one product or makeup item plus some cute extras. Or you can get the box that has 3 polishes...or the box that has all products. Julep products are amazing: total spa quality! I am really in love with the brand and adore the cute boxes. With membership, you can invite friends to join and earn referral points towards free boxes. Total Beauty Collection Boxes: These Total Beauty Collection boxes are great because there is no subscription. They individually curate boxes and then they release them for a special price. The boxes contain 5 items: 1 is revealed and the other 4 are "mystery" items. The boxes retail between $20.00 -$30.00 depending on the box but contain upwards of $50.00-$75.00 worth of items. If you keep following my blog, you will get some "previews" of these boxes since I am a Total Beauty Blogger. I usually give a "sneak peek" of the box and include a discount code, too! So, be sure to check out those posts. These boxes contain large deluxe and lots of full sized items. There are certainly more beauty subscriptions out there...GLOSSYBOX, PopSugar, SampleSociety...just to name a few. I might need to explore a few more beauty sample subscriptions for the sake of "research". I really do get introduced to so many great new-to-me brands by beauty sampling. I used to subscribe to GLOSSYBOX, and it is awesome, but I had to let a subscription go. Since it was the most expensive one, I let that one go. However, I am considering subscribing to them again in the future. My fellow beauty sample box lovers, what subscriptions are you loving lately. Also, what about non-beauty subscription boxes? Are there any that I should check out? I know there is a "healthy snack" box out there but I can't remember what it is called? I would totally love that one! Elizabeth Arden 8-Hour Cream: I know, I sound like a broken record...however, I can't resist. I am obsessed with this stuff! It heals my dry lips like nothing else. It is really a basic product petroleum and vitamin e. However, it is also somehow magic in a tube. It also works great on dry cuticles and general irritation. I literally do not leave home without it. MAC Vanilla Eye Shadow: This is my quintessential shadow basic. Rarely do I do my eyes without it. It is my brow highlight and inner corner shadow. I pretty much pair this with anything. Foreo Luna: I adore this skincare device. It is so slim that it is incredibly easy to travel with. Plus, I have literally charged it once in the entire time that I have owned it (like a year!). So, it is super easy to pack. I like the "boost" it gives to regular cleansers for a wonderful deep-down clean plus mild exfoliation. Be sure to click this link to check out my full review! Milani Luminoso Blush: This gorgeous baked blush from Milani is one of my total favorites. It always looks pretty on and goes with any look I might do. It is simply the blush that I reach for most often. Aphogee Keratin and Green Tea Spray-In Reconstructor: This is the first thing that I like to put on my hair after getting out of the shower. It adds light protein that penetrates when you dry your hair. Be sure to click the thumbnails below to see what my fellow Makeup Wars Bloggers love to pack when they travel! Great picks! Love that travel bag you use! What a great idea! Thanks for sharing your favorite subscription services too! I adore the Hold Me bag! I always use it for my beauty items when I travel! It's amazing sometimes how similar we are yet so very different. I love my Hold Me bag and I use my subscription boxes for travel items too. Your choices on so many things could be mine - like the Foreo Luna. The Hold Me bag is adorable. Thanks for sharing. Though I could never pack samples of hair care I haven't tried before. If I had a hair freakout due to a new product it would ruin my trip, ha!